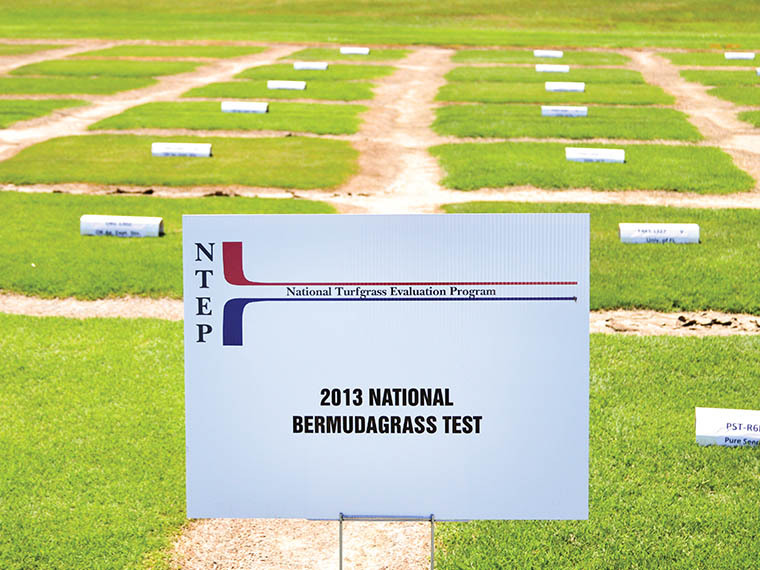 The National Bermudagrass Test, which was established in 2013, was on display at the 2015 Turf Field Day. Photo by Sarah Buckleitner. Grass is an essential part of the American dream. We coat our lawns with it, play our biggest sports games on it, and decorate some of the most important places in our country with it. However, the hard work that goes into producing hardy, beautiful turf often goes unnoticed. Research in the Mississippi Agricultural and Forestry Experiment Station has helped play a role in ensuring that turf meets the needs of its users. Wayne Philley, senior research associate, and Dr. Christian Baldwin, associate professor, in Plant and Soil Sciences, conduct the Mississippi Agricultural and Forestry Experiment Station turf variety trials, which compare different varieties of turf against standards in order to determine those that perform best. The variety trials are coordinated by the National Turfgrass Evaluation Program, and each has a duration of five years. In order to host a variety trial, each host university has to apply to a committee put together by the National Turf Evaluation Program, who then evaluates the applicants to decide which sites will be most suitable for specific trials. Mississippi State is currently involved in three trials: the National Bermudagrass Test-2013, National Warm Season Putting Green Test-2013, and the National Tall Fescue Test-2012. “The variety trials are conducted in order to gain information about which turf varieties perform best in different geographic locations and for specific applications,” Philley explained. “Mostly the varieties we test are for seed companies, to see how their new products perform before they’re put on the market.” “Also tested are the standards, or varieties that consistently produce the best results in a given application. For instance, Tifway bermudagrass has been our standard for vegetatively propagated cultivars and has been around since the 1960s. The goal currently is to produce a seeded variety that performs at the same level of quality,” Philley continued. Seeded varieties of turf are established by adding grass seed to soil and watering. This makes them a lot cheaper than purchasing a vegetative variety—which can only be obtained through sod—however, they also have much less uniformity, as each seed has its own individual phenotype that will contribute to the way the turf looks and performs. “To homeowners and companies looking for the highest quality turf they can find, I always recommend purchasing sod. However, if uniformity is less important to you, seeded varieties will also do the job,” said Philley. Leaf texture, uniformity, and density are also important. Leaf texture refers to how fine or coarse the grass leaf blades are—and the finer the better. Similarly, people prefer uniform, dense grasses. The importance of these qualities is also dependent on the use of the grass. “Depending on whether I’m looking at it for a home lawn or putting green, I’d give different priorities for each of those categories. On a putting green, you want high density, and very fine leaf texture, because those will affect the way the ball rolls. On a lawn, it might be more important to have something soft.” Evaluators have to go through training in order to accurately evaluate the turf. “Turf evaluators have been trained to not place too much emphasis on any one category. People are typically very drawn to dark green, so you have to learn not to focus too much on that, and instead take all of the variables into consideration when rating the variety,” Philley explained. Technology has also begun to play a role in turf assessment. “Sometimes it’s hard to tell if the differences we see from state to state are truly location differences due to environment or evaluator differences,” Philley stated. With the use of tools like a chlorophyll meter, a Normalized Difference Vegetation Index device, and unmanned aerial vehicles that fly overhead to capture images of turf to be analyzed for uniformity via computer programs, turf scientists are ensuring that observer bias doesn’t play a role in the evaluation system. Two of the varieties tested in this round of trials were developed by Philley, and they combine the fine-leaved texture of African bermudagrass with the hardiness of common bermudagrass. The variety trials were shown off at a recent Turf Field Day, coordinated by Jay McCurdy. “I think out of most of the turf-related research here, we’re most proud of the ongoing evaluation of Mississippi-bred turfgrasses at our facility,” McCurdy stated.